The Ryobi RLT36 One+ Cordless Grass Trimmer has an ergonomic front handle that helps reduce vibration and improves the overall comfort. The metal plant protector on the front of the device shields flowers and delicate surfaces from getting damaged. For optimal cutting length the RLT36 is equipped with auto-feed line feed. The Li-Ion battery is placed at the back for a better weight distribution while working with the cordless grass trimmer. A variable speed trigger extends run time and allows for. 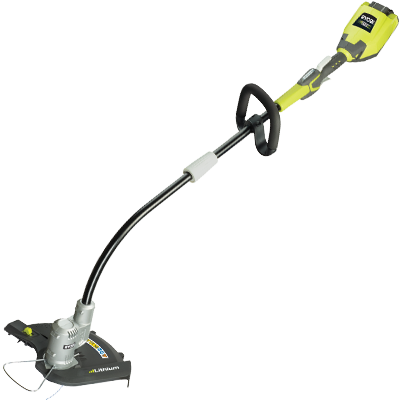 Ryobi 36v li-ion line trimmer offering petrol performance and runtimes but with 97% less vibration and noise with no emissions.